Clement MINER Sr. (1560 – 1640) Thomas Miner’s father. He is Alex’s 11th Great Grandfather, one of 4,096 grandfathers in this generation in the Miner line. Clement Miner was born in 1560 in Chew Magna, Somerset, England. His parents were Thomas MINER and Joan [__?__]. His wife is unknown. Clement was buried in Chew Magna on 31 Mar 1640. 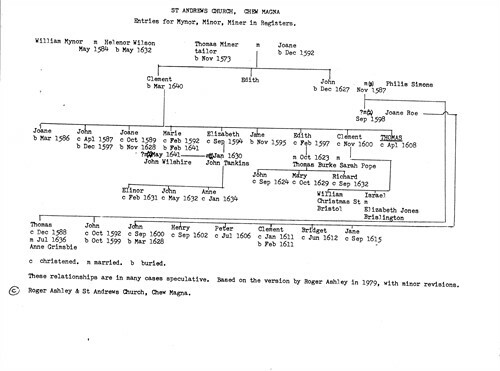 Clement Miner Sr – Family Tree – This is the most accurate information we have of Thomas Minor’s ancestry taken from the Registries of St. Andrew’s Church, Chew Magna, England. (First published in 1987). Clement’s son Clement Jr lived near Bristol. Descendants continued to live in England. An abstract of the will of his daughter Mary exists. The will was dated 4 Dec 1640, and proved 23 Feb 1640/41, value of estate was £25-2-2. It lists the children of Clement Miner (William and Israel), Thomas Bucke (Richard, Mary and John), and John Tompkins (John, Eleanor and Mary). Somerset Record Office DD/X/SR 3 b, p89. Clement’s father was Thomas MINER Sr. (1530 – 1573) Thoms Sr. is Alex’s 12th Great Grandfather, one of 8,192 in this generation in the Miner line. He was born about 1530 in Chew Magna, Somserset, England. His parents were William MINER and [__?__]. He married Joan [__?__] about 1554/9. He was a tailor and resident of Chew Magna in 1556 at which time it was known as a cloth making town. He was buried at Chew Magna on 15 November 1573. An abstract of his will, dated 20 October 1573 and proved 15 September 1574, survives. It indicated his desire to be buried in the church yard of Chew. To the church he granted 4 pence, to sons Clement and John a lamb each, to daughter Edith a lamb and a yearling heifer, residue to wife Joan, Executrix. To William Winch and Thomas Horte as witnesses he granted each 20 pence. The inventory of his estate totaled 16 pounds 5 shillings. The manor court rolls show Joan succeeding her husband on 19 Jul 1574 under a grant of 29 Jun 1554. She was buried at Chew Magna on 21 December 1592. Thomas’s father was William MINER (? – 1586) (Minor, Mynar) William is Alex’s 13th Great Grandfather, one of 16,384 in this generation of the Miner line. He is listed as a resident paying taxes (one of 13) in North Elm section of Chew Magna, Somerset, England in 1523 (Paid 4p tax on goods assessed at 2£4s.). Wife unknown. He received a Chew Magna house and land grant on 29 Jun 1554 with his son Thomas and Thomas’ wife, Joan. He was buried at Chew Magna on 23 February 1585/86. He may be related to John Minere who appears on a Chew Magna manor account roll for the year 1494-5 as paying for the grass on 46 acres of meadow and to Joan Minere, a widow, who appears on that roll as paying a tax known as churchscot. There is a document written about 1683 and titled “An Herauldical Essay Upon the Surname of Miner” which traces the Miner ancestry back to Henry Bullman in the 1300s. The purported line of descent was Henry (died 1359) -> Henry (m. Henrietta Hicks) -> William (b. ca 1375) -> Thomas -> Lodowick (m. Anna Dyer) -> Thomas (1436-1480, m. Bridget Hervie) -> William (m. Isabella Hartope) -> William (Buried 23 Feb 1585) -> Clement (died 31 March 1640) -> Thomas (the immigrant). A Study, named “The Curious Pedigree of Lt. Thomas Minor” by John A. Miner and Robert F. Miner and published in the NEHGS Register of Jul 1984 (volume 138, pages 182-5), indicates that the contents of this document and the coat of arms it presents are FALSE. ii. Israel Miner m. Elizabeth Jones of Brislington. This entry was posted in 13th Generation, Line - Miner and tagged Thomas Miner. Bookmark the permalink.